Japanese term - literally "pattern paper"*. It is the paper stencil used in katazome through which rice paste resist is printed on lengths of kimono cloth. Japanese term - literally "pattern dyeing"*. It is a Japanese printing and dyeing process that uses stencils (katagami) for printing on fabric. Generally, a resist made from rice paste is pressed through the stencil onto the kimono cloth. The cloth is dried and then dye is applied to the fabric. Once the dye is set, the cloth is rinsed. The water removes the rice paste resist and the fabric is left covered with designs in dye. Shifu refers to both the handspun paper strands and the cloth that is woven from it. Shifu is a Japanese process where mulberry (kozo) paper is sliced into a continuous flat strip, dampened, and then handspun into thread form. What type of paper do you use and is it archival? All of the paper I use is archival. The varieties include cotton, abaca, and mulberry. I not only use my own handmade papers, but also incorporate traditionally made Japanese, Mexican, and American papers. I feel it is important to keep papermaking alive both in our culture and throughout the world. How do you color your paper? The paper pulp is usually mixed with pigments before forming into sheets. The sheets of paper are then washed with acrylic colors or dipped into indigo dye baths. Do you really hand carve all of those pieces? Yes, each piece is handcarved individually with a small knife. A laser is not used. Even when several pieces look like they have a similar pattern of carving, they are not layered during carving. 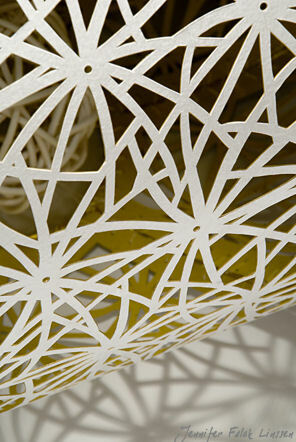 Each piece of paper is individually carved by hand. The paper appears smooth in some light and textured in others. Why is this? Because it is handmade, the paper will have texture and surface variation. Directional lighting can bring out this surface variation. And depending on what type of paint and indigo dyeing I use, the paper's surface may appear smooth in some light and textured in others. Also please note that my framed two-dimensional work will have a deckle edge. Pulling each sheet individually with a deckle and frame creates this textured edge. I see lines in the paper. Why do they only appear in certain areas? Crease or fold lines are added to the carved paper with a bookmaker's bone folder. The lines help the paper curve into specific shapes. Japanese term for pictorial stencil carving. Japanese term for cut paper artwork. This type of cut paper is used for illustrations and fine art, not stencils. Sometimes referred to as Ki ri ga (kiriga). Chinese term for cut paper artwork. Pronounced gee-an jeer. Chinese term - literally "window flower." It is jian zhi (cut paper art) which is traditionally attached to a home's windows for decoration. Japanese term - literally "crest cut." It refers to the small, often circular stencil used to dye crests on garments. Japanese term - literally "cut paper." Kirigami is a form of origami where small cuts are allowed to form new shapes and objects. Japanese term: "to cut" / "cutting." German term for cut paper artwork... "scissor cuts." Pronounced shear-n-SNIT-a. Dutch term for cut paper artwork. Prononced KNIP-pen. Polish term for cut paper artwork. Pronounced vee-chee-NON-kee. * From one of my favorite books: Carved Paper - The Art of the Japanese Stencil by Susanna Campbell Kuo, edited by Susan Shin-Tsu Tai, Santa Barbara Museum of Art and Weatherhill, Inc., New York & Tokyo, 1998, ISBN 0-8348-0409-3.